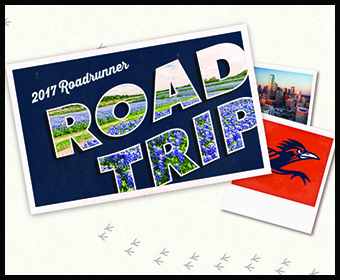 (May 2, 2017) -- UTSA is energizing alumni and fans through its sixth annual Roadrunner Road Trip. The road trip kicks off tonight in the Dallas/Fort Worth area, where UTSA Head Football Coach Frank Wilson and Men's Head Basketball Coach Steve Henson will headline a dinner social. "Every spring, we look forward to visiting our alumni," said Jana Kennelly, assistant vice president for alumni engagement and executive director of the UTSA Alumni Association. "We have a strong alumni network of more than 116,000, and our Roadrunner Road Trip is a great opportunity to get them excited about the growth happening at the university." Wilson and Henson will join Lynn Hickey, director of UTSA Athletics, and representatives from the UTSA Alumni Association for a night of fun and entertainment. Attendees will celebrate UTSA's academic and athletics victories, celebrate in time-honored traditions and connect with fellow Roadrunners. The Dallas – Ft. Worth stop is tonight from 6 p.m. to 8 p.m. at Blue Mesa located at 8200 Dallas Pkwy. in Plano. Admission is $10 for UTSA Alumni Association members and $15 for non-members and guests. Children 12 and under are free. Food and drinks will be provided. Guests may register in advance online or at the door.